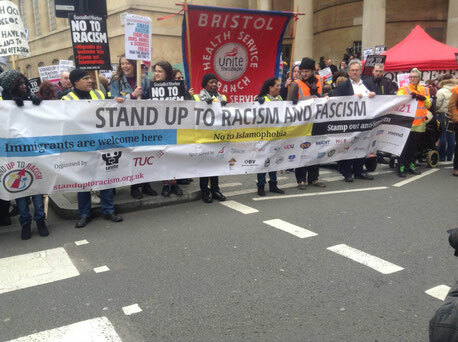 This was a very large demonstration of about 20,000-30,000 people, officially organised by TUC together with the SWP front organisation Unite against Fascism, in which banners and slogans against Racism were displayed. 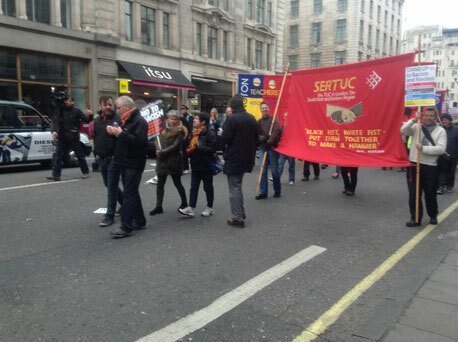 The largest contingent by far was the Socialist Workers Party who had organised their members to carry placards and sell the Socialist Worker. 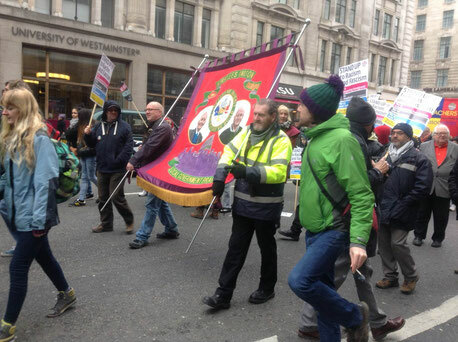 The next biggest contingent was that of the Socialist Party of England and Wales, the local section of the CWI. Both these centrist parties had organised their members and they were very prominent in the demonstration. There were also contingents from local Labour Party branches as well as from the Green Party which is trying to parade itself with a left face. 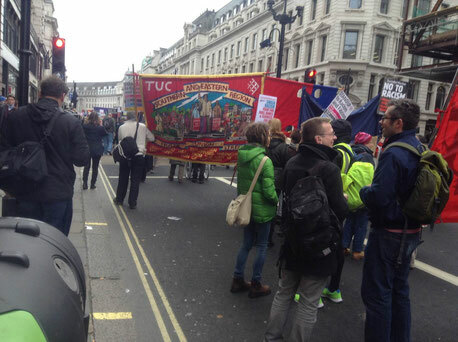 There were also many trade union banners from Unite, SERTUC, NUT, PCS and others. Addition contingents were from the Communist Party of Britain, the RS21 grouping as well as various small grouplets. Also represented were black and ethnic organisations, like Black Lives Matter and Muslim Lives Matter, and the ASLEF and UCU trade unions. Finally, there were some international organisations represented like ANPI Londra, a small group of comrades campaigning against Islamophobia called SORT IT OUT, as well as Antarsya UK. The marchers paraded from Oxford Street through Piccadilly and onto Trafalgar Square where speeches were made by a range of organizational representatives. 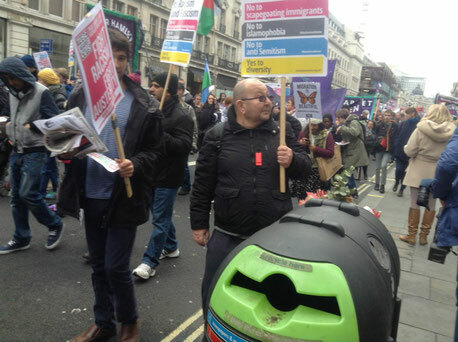 In his address to the marchers, Weyman Bennett, a member of SWP and representing Unite against Fascism, stated that the march was important to demonstrate our opposition to hate crimes perpetrated against migrants and others. First it was Breivik in Norway and now it’s is Golden Dawn in Greece. The slogan today is you shall not pass meaning the scapegoating of Muslims; we remember the past under fascism in Germany of the Holocaust and gas chambers. Bennett claimed that the current general election campaign in the UK is the most racist campaign, regardless of party, he has ever witnessed. Farage (Leader of UKIP) is a racist, Bennett maintained, and he tells lies against migrants. Don’t blame migrants, he advised, rather UKIP and their supporters are to blame. Carol Duggan, the aunt of Mark Duggan who was gunned down by police just before the 2011 riots, said that “Stand Up to Racism” is a wonderful campaign, representing the view of all those participating in the march – that we can all live in harmony and the police will be made redundant. Ms. Duggan related how, on the 4th August 2011, they [the police] murdered her nephew Mark Duggan who was from Broadwater Farm housing estate where PC Blakelock had been murdered. We, Mark’s family, paid the price for Blakelock’s murder. But, she asked, are the police actually searching for the murderer of Mark Duggan? The IPCC police internal complaints commission claims to still be investigating who is responsible, but the police have done nothing to find who killed Mark Duggan. The IPCC are so inept, forcing us to investigate the death of our Brothers ourselves. The police are born liars and will do anything to keep their pension, look at what they did at Hillsborough. Support the Public Meeting and find out the truth about Mark Duggan’s execution. NO JUSTICE, NO PEACE! Janet Elder spoke of how her son died in police custody and linked it to 25 years of whipping up racism and Islamophobia in this country. Many persons are murdered by the police, she claimed, but the Crown’s Prosecution Service will not indict police officers. And police officers get away at being racists to people on the streets. She too concluded, NO JUSTCE NO PEACE! Marcia Rigg spoke of her brother Sean Rigg who she said died at the hands of police officers 7 years ago. Sean had mental health issues, he was in a psychotic condition and couldn’t breathe, and after 11 minutes collapsed. The police officers who held my brother in custody had treated him like a dog, none of them cared and they allowed him to die. Metropolitan police officers are guilty of perjury in this case and said that On Saturday 21st October a march will be held by grieving families in which they intend to march on Downing Street. Here too, Ms. Riggs speech concluded with the slogan NO JUSTICE, NO PEACE! Stephanie Patterson from the United Families for Leon Patterson told how Leon Patterson was killed 22 years ago while in police custody and that the second inquest into his death determined that it was caused by an unlawful killing. Nevertheless, the authorities still refuse to give me a death certificate. Since 1967, she claimed, no police officer has been prosecuted and every six days someone dies in police custody. Steve Hart from Unite spoke about multi-culturalism and talked about the electoral victory of SYRIZA in Greece, and how the positive message is that we are winning. UKIP which is against immigrants wants to drag us back to the National Borders. 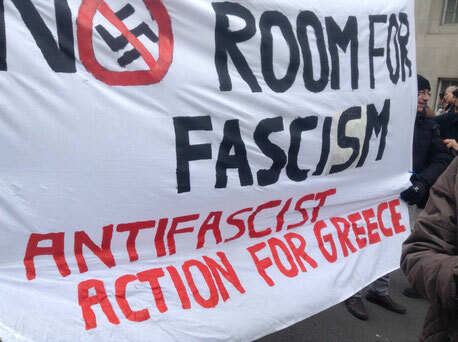 But we have to say, look at Golden Dawn in Greece – they will all be in prison soon. The battle is being fought in Greece by Syriza and in Spain by with Podemos. We are going to win! Billy Hays, General Secretary of the CWU said that the march held today is a broad-based action against racism and for Multi-culturalism. UKIP plays a big role in contemporary racism in the UK, as it scapegoats immigrants. Farage is following in the path of Enoch Powell regarding immigration. Hays said that we need to build a massive Anti-Racist Movement. Break the sieges against the Muslim movements and speak up against imperialis, its wars, racism, and Islamophobia. Mohammed from the Muslim Council of Britain said that Islamophobia poses a challenge to those battling against all kinds of racism. We must stand up against all forms of hatred. Our struggle must be against racism and injustice. The Muslim Council of Great Britain hopes to form a United Front on this matter. Christine Blower General Secretary of the NUT said that we must stand up to racism and fascism, and say no to Islamophobia. As human beings, we value diversity. Our slogan should be they shall not pass. Respected MP George Galloway said that his heritage was from Ireland and that racism and bigotry had not gone away during the course of the years. Rather there is still much work to do. We must stand up against racism and anti-Semitism which, still exists in the UK. Today Muslims are targets of witch hunting; therefore we must demand police protection for mosques and Muslims. We should have a Respect Agenda which calls for respect for everybody. The march included workers of all ages and youth; approximately 30% of those participating were black people, other people of colour, and migrants. As important as this demonstration was, it can only be a start for a more serious campaign against racism, one based on the working class and the oppressed (blacks, Asians, and migrants) and their mass organizations. Revolutionaries have to energetically support such a campaign and fuse it with a program for socialist revolution.